Rakusan did not include the Fan Series in his main sequence numbering. Therefore, the original number used for each of the 36 Series prints has been modified to identify the Fan Series members of its theme. The five different fan silhouette shapes have been here assigned arbitrary numbers 1 through 5. To indicate a fan design these shape designations are added to the 36 Series number separated by a hyphen. In themes which contain duplicated fan shapes, one has been arbitrarily designated A and the other B. 101-3B indicates that this is one of two Fan Series designs with fan shape 3 in the 101 Rose theme. Like all other designs in this series, 101-3B was only produced in a single print run, and few copies are currently documented. 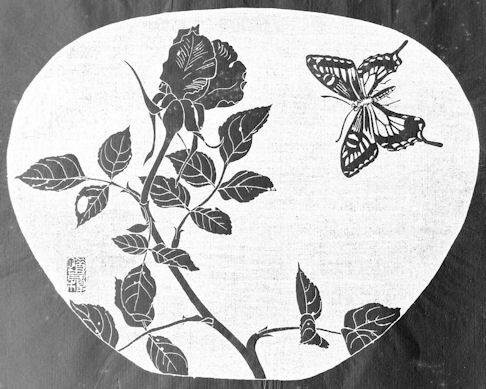 The composition of 101-3B includes a single rosebud and stem with some leaves accompanied by a flying swallowtail butterfly. All of the botanical elements in the design are shown silhouetted from the side with internal lines - essentially a line drawing with the solid background darkened out. 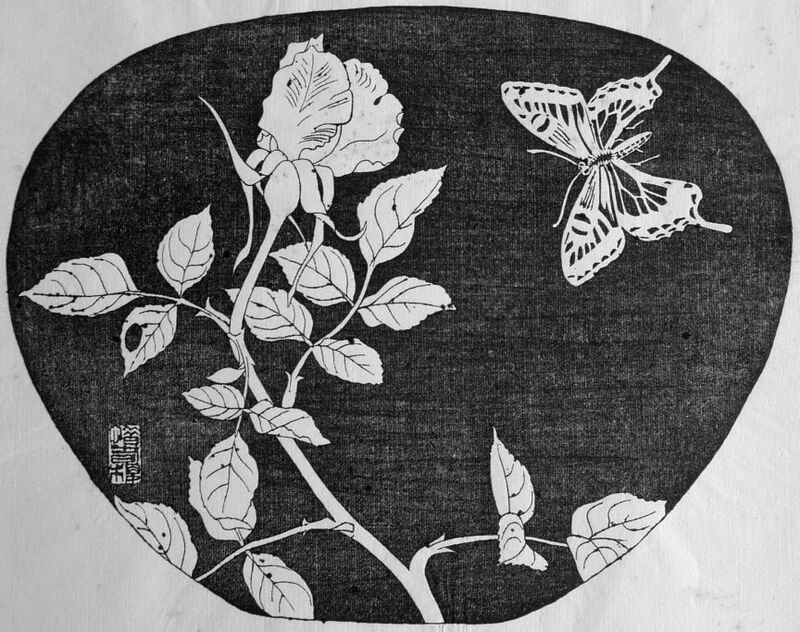 The stylized, symmetrical holes in the leaves are a design mannerism copied directly from 伊藤若冲 Itou Jakuchuu (1715-1800) whose work inspired the development of the entire series. (Jakuchu's influences on this series are the subject of a separate article not yet available online.) The swallowtail butterfly is rendered as an exact negative with its natural color patterns reversed. Its wings are fully spread as though seen from directly above. The different vantage points for the butterfly and the rose make for a oddly static composition. Asian Swallowtail (or Chinese Yellow Swallowtail), Papilio xuthus, (並)揚羽, (なみ)あげは, (ナミ)アゲハ, (nami-)ageha, (lit. (common) swallowtail), is one of several kinds of swallowtail butterflies found in Rakusan's artworks.